Fight Fans, we have less than a week before Bellator MMA returns for the third event of 2013 to be held inside the Santa Ana Star Center in Rio Rancho, New Mexico. For those fortunate fans who were able to make it to February and July events, they know that when the Bellator promotion hosts an event within state lines that they bring the heat with their fight cards. The past fight cards have featured some of Bellator’s biggest stars, most significant contender bouts and even a dual-main event that had two titles on the line. At the Bellator 97 event in July, Bellator’s first pay-per-view main event was formally announced when MMA legend Tito Ortiz entered the arena to face-off with fellow newly acquired superstar “Rampage” Jackson. Needless to say, the promotion delivers quality action when they visit town and October 25th should be no different when Bellator 105 is live inside the Santa Ana Star Center. In our preparations for the event, we wanted to point out some of the most interesting points to consider when debating whether this event is worth the Friday night. 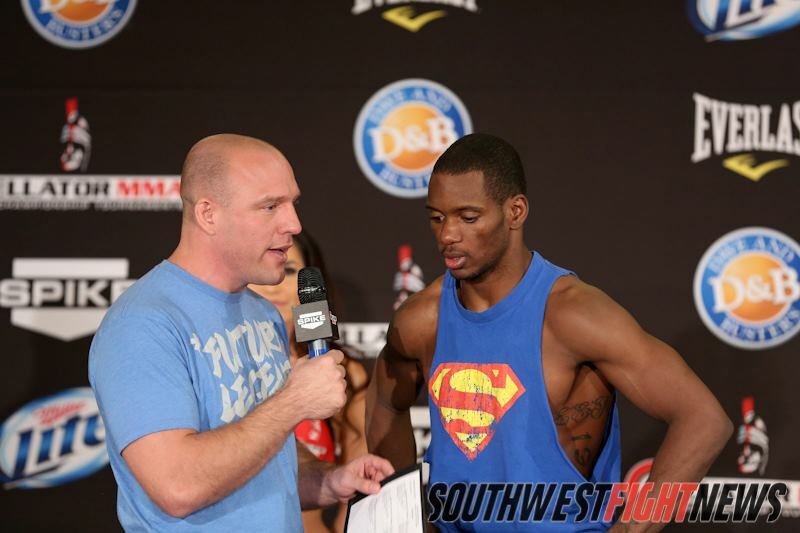 “Ill Will” Will Brooks (11-1) is not only one of Bellator MMA’s premier fighters but he is one of the sport’s most talented fighters and Albuquerque has seen plenty of Brooks as he’s competed at New Mexico’s Bellator 91 and 97 events. Brooks has explosive wrestling talent and has shown improvement in his all-around talent each time he has competed. Since turning professional in early-2011, Brooks has won eleven of twelve and has come very close in challenging for the promotions Lightweight Title. The reason for the “almost” label is because back in February, Saad Awad would spoil the championship hopes with a quick knockout inside the Santa Ana Star Center. That fight will come back full circle this Friday night. Brooks will get a rematch with Awad in the same arena as the first meeting and once again the two will be competing for the opportunity to fight in the Lightweight Tournament Final where a win will award one fighter the opportunity to take on the winner of the upcoming Michael Chandler and Eddie Alvarez title fight. If you are interested in witnessing some of the sport’s premier talents, look no further with the opportunity to watch Brooks fight live. He very well may end up as an elite talent with great potential to become a World Champion. Brooks has yet to be in a dull fight and his rematch with Awad already has some legitimate buzz around it. If you are a Bellator MMA fan, then this fight has huge implications and will lead to a huge fight for the winner. That screams drama fight fans. 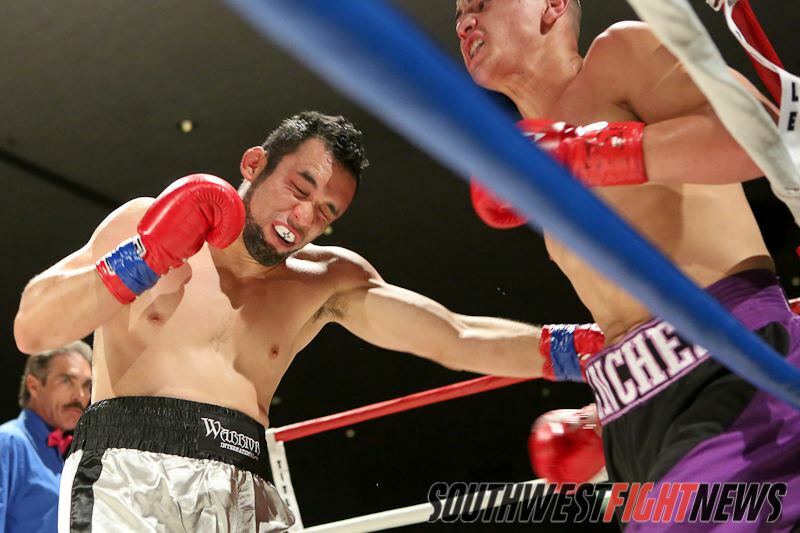 “The San-I Warrior” has been a staple of New Mexico’s regional circuit for over six years and it would be remarkable if a fight fan wouldn’t recognize the face or the name. Sanchez (12-4) has fought most of his career under the King of the Cage banner and while he achieved the pinnacle of the promotion by capturing their title, it has been a long time coming for Sanchez to reach the next level of competition. Now training in Albuquerque with Ray Yee in the Albuquerque Kickboxing Academy, Sanchez is poised to improve his striking skills to compliment his impressive ground game. Sanchez has won over half of his fight via submission and while he has a knack for being crafty off of his back, it is the dominant and smothering top game that has done wonders for his winning record. Arguably Sanchez is best known for his pair of bouts with Donald Sanchez; where the intangibles of his skillset really shined brightest. Sanchez has big time heart, a granite chin and impressive durability. Sanchez has a very large fanbase which could be debated as being one of the largest in New Mexico. His fan section will be loud and this will be fight fan’s opportunity to see Sanchez step outside of the regional circuit and take a step up in completion. As mentioned before, Bellator MMA will now have hosted three events in New Mexico. The successful company is only second in popularity to the UFC and represents the most successful MMA show to ever come to New Mexico. The fact that the promotion has returned this many times in indicative of the strong support they garner from the locals and the fact that they have put on such high profile fight cards only speaks volumes for how much they appreciate the market here in the state. These significant factoids should be seen as major compliments to those of you who have attended the shows or watched them on Spike TV. Sanchez has flirted with the crossover to boxing on different occasions. His boxing skills may be in full display this Friday night. Showing up to support this third show will only strengthen Bellator’s enthusiasm to keep on returning to this area and the more support received will lead to more major fight cards. At the last show in July, Michael Chandler and Ben Askren defended their titles and those two fighters are considered to be Top-10 ranked fighters in their respective divisions. The last time New Mexico received that sort of star-power was back when the WEC visited Albuquerque and featured Carlos Condit as the main event fighter. That show was well over five years ago and it is overdue for our fight fans to get some legitimate star power in a local show. This is the “flying under the radar” fighter of the event. While most of the focus will be on Will Brooks and the local undercard, many fans are definitely overlooking one of MMA’s most underrated fighters fighting on the fight card. “Tiger” is 24-1 and started his career unbeaten for over four years and while he lost a split decision to Rich Clementi 12-months ago, he has been on a tear since dispatching each opponent quickly and impressively. He is currently coming off a 100-second drubbing of the tough veteran Marcus Davis in the semi-finals of the Lightweight Tournament. Fans can expect some very technical talent from the Russian Sambo specialist and at only 24-years old he is definitely one of Bellator’s premier talents. Interestingly enough, Tiger may end up facing off with the other Lightweight phenom Will Brooks in the tournament finals. Locals will get to see both in action and that definitely will spark some interest if the two end up meeting down the road on a future Bellator MMA fight card. Your favorite local fighters like the pictured Adrian Cruz will be in action this Friday. Will you be supporting them? The Bellator MMA main card fighters are being showcased on national television which means their opportunity for sponsors is high and the likelihood they get more fights for the company is almost certain. For the local undercard fighters, the stakes aren’t as beneficial and we as fight fans can be the difference makers for their success outside of the cage. When Adrian Cruz, Josh Lanier, Rocky Ramirez, Angelo Sanchez, Frank Baca and Steve Garcia enter into the Bellator MMA cage; they will need every single one of their supporters to do what is expected from them as supporters of this local MMA scene. It starts with tickets as each local fighter makes money from their ticket sales and also going forward shows promoters how valuable each fighter can be to their company. If Bellator MMA is able to secure one thousand purchased tickets for example and Judgement MMA’s Adrian Cruz sells 250-tickets and another local manages only 50 then it becomes apparent who will be in the best graces of the company when they are looking for a fighter to really represent their brand. It also helps sell out the arena which only helps we the fight fans as Bellator MMA will return to a successful market and other promoters will find the area a valuable one to bring their event too. Increasing the visibility of our locals fighters only make them more valuable to prospective companies who may invest their money into a fighter in a sponsorship type opportunity. For these reasons, the fight fans become extremely valuable to the fighters. It is very noticeable as to which fighter has the biggest fanbase when they roar during entrances and because of that, they become premier talents for local events to utilize to sell their tickets. Stay tuned to SWFight for more event coverage, bout breakdowns and analysis. For more event updates, including fight night live results follow me on Twitter @KingStark24 and the SWF Twitter page @SWFight.